I don't know what issue and year, but I remember one scene from one story from comic book like it is tattooed to my memories. WHat ever the story was about, it was a story involving Leia and a stormtrooper that happened not only to come from Alderaan, but the trooper actually had a rock from the then destroyed aldreaan as an amulet or necklace and this necklace was part of the scene between him and leia. I wish i knew what issue it was, and could read it again. Whoa, an Alderaanian Stormtrooper TIE Pilot! What, you can't multi-class in the EU?!? Apparently you can. I have just never heard of this character, or at least have no memory of him if I did read that comic in my childhood. I usually had to go with my mom on the weekly trips to the grocery store and it was the routine for me to go straight to the comic rack where I read as many comics as I could before she was done shopping, because we never bought any comics. I do not remember this issue. The character sounds kinda like a PC that a player might want to make: A former stormtrooper/TIE pilot from Alderaan who deserted the Empire after Alderaan was destroyed (A player in my very first campaign played a retired Imperial captain from Alderaan). I think that by my teen years when I started playing this game, I probably would have said no the character having been both a stormtrooper and a TIE pilot - I probably would have told the player to pick one. Of course that was pre-EU and even when the EU formed, the Marvel comic was left out of it at first. 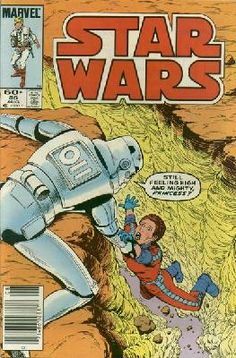 I remember my first campaign players and I reminiscing one time about silly stuff we remembered from the comics (and the Droids and Ewok cartoons). Now, if the player came up with a plausible explanation for how his PC had been both, I may allow the player to sell me on the concept. No, Vader doesn't rise out of the water like that, but he was fully submerged against his will and he was fine, although it was not at a high pressure depth. The reason Vader got his iconic appearance is because the original film's script had some stormtroopers and Vader invading Leia's captured ship without showing how they transitioned between vessels, and concept artist Ralph McQuarrie envisioned Vader as having a spacesuit. In his view, stormtrooper armor could function as a spacesuit, and they all just floated between ships then blasted their way in. Lucas had envisioned a docking tube with a universal airlock but thought it was better not to show it, but then when he saw art he loved it and Vader's normal everyday costume was based on the "spacesuit" version of the character. (And stormtroopers were shown standing on the outside of the Death Star later in the film.) Vader's breathing was added for effect without any explanation for why he wears the suit and breathes like that all the time. In the final battle of the film, TIE fighter pilots were shown wearing full body spacesuits suggesting they do not have an artificial atmosphere in the cockpit like the Rebel starfighters do, but Vader appears to wear the same suit he always does with no additional gear visible. It is not an unreasonable presumption that Vader's suit is likewise spaceworthy until his air supply runs out. Rebel pilot suits are presumably able to become spacesuits in an emergency where breathable atmosphere runs out or they have to eject. (I always envisioned the pilot suits are self-sealing - The collars open up and something pops out to seal up the open parts of the helmet.) The chest device on Vader's suit is similar to the Rebel pilot suit chest pieces. In the same TESB scene you refer to where Artoo is submerged in swamp water and swallowed by a monster, Luke jumps into the water after he gets out of his ship and his pilot's suit chest piece is fully submerged. I feel it does not seem too much of a stretch for Vader's suit to be submersible at shallow depths. The SW cartoons and comics even have lightsabers functional underwater! To be fair, Ackbar is in the story more than Raddus. Ackbar continues his role from TCB as the king's chief of security (until the end where the king is imprisoned by the Empire and Ackbar escapes with Raddus). In the story, Ackbar is ranked Commander while Raddus is already ranked Admiral. Ackbar presumably wasn't a Rebel admiral until after Raddus' death or Ackbar would have been in Rogue One. Raddus seems to be the Admiral of the Fleet in RO, which was Ackbar's same position several years later in RotJ. Raddus is logically a little older than Ackbar, so I find that I wasn't bothered by Raddus' superiority to Ackbar. It makes sense in the timeline. There are both very important characters to film continuity, and honestly I would have liked both characters to have been used more in this story than they were. But isn't actually TIEfighter pilots really "nothing more" than specialized stormtroopers. What few legends and eu books that delve into "training" or Stromtrooper "skill packs" often include piloting to at least a well trained level, as well as walker and speeder piloting etc. To me it seems, and here i can be way off, that both the tie fighters and the stormtroopers hve the same basic trianing, leaning the basic skills that include basic combat, as well as piloting, and then later specialize to their "named job"
I agree TIE pilots and stormtroopers would have some similar or same basic training in common, but I would think the Empire military machine would be good enough at identifying potentials in candidates and direct them to one or the other. If a stormtrooper candidate shows good enough piloting potential they would be moved to the naval academy before they would become a stormtrooper. I personally don't see someone being assigned to one, serve for a while in one, and then "transfer" to the other. It also depends on your concept for stormtroopers. In my SWU they stopped being exclusively clones but were still raised from a very young age to be stormtroopers not unlike the Republic clonetroopers, the Jedi, and First Order stormtroopers. If a stormtrooper shows mechanical aptitude, they might be directed into the specializations that need that like scout troopers or patrol troopers. In my SWU, the Imperial naval academy doesn't start until adulthood (maybe as low as age 16 for humans) like Biggs, so potential TIE pilots would already be too old to begin training as stormtroopers. Now I can see a stormtrooper/TIE pilot as more likely in the post-RotJ setting when the Empire is cast into chaos, but I'm not concerned with that setting right now. If another GM wants to have a stormtrooper TIE pilot in the Dark Times or Classic Rebellion Era, more power to them. My point in the same training, is that while you are correct imo about the candidate being sent to flight school, this in now way barrs the trooper or even troopers to have some skills in piloting, setting them above the "common" trooper, but still they are not actual pilots, to me in this particular story it seems the stormies did in dee know how to plit and fly a tie, but they were not "pilots" but from the looks of things, simply "rplacement" or reserve pilots if needed. I can see it reasonable that in a SW setting, where "everyone" knows basic flying, that some may have a knack for flying but performing much better as a trooper. something is wrong here my prior post was filed 3 times, and i have no option to delete it as i can't delete a post that i respond to or something, ?????? You can only delete a post if there are no replies to it yet. So you could have deleted the oldest post first, and then after that was gone the second post (new oldest post) leaving the original post only. It won't let you delete any post that already has a reply after it. Admins and mods can delete any post, so I took care of it. No problem. I think only special forces would get any sort of meaningful cross training, because of the effort and cost involved. While Stormtroopers and some Imperial Army infantry might have a bit of repulsorlift or ground vehicle training, I don't see them having much idea about piloting, just because it's complicated. The same would hold true for pilots. Really I only see Royal Guards, Storm Commandos, and the various intelligence agents having any real idea of how to fly in combat, because they might have to (well, the Royal Guards will anyway). I've been pretty stand-offish about new Disney comics material, but I have to say that two characters have made me reconsider this: 0-0-0 and BT-1. They are, essentially, the evil twins of Artoo and Threepio. Admittedly, my rather warped sense of humor makes me appreciate them a bit more, but a lot of the things these two pull off are just laugh-out-loud funny. Thoughts? I adore those two. Triple Zero and BeeTee are my favorites and a big reason for the Doctor Aphra title's success. 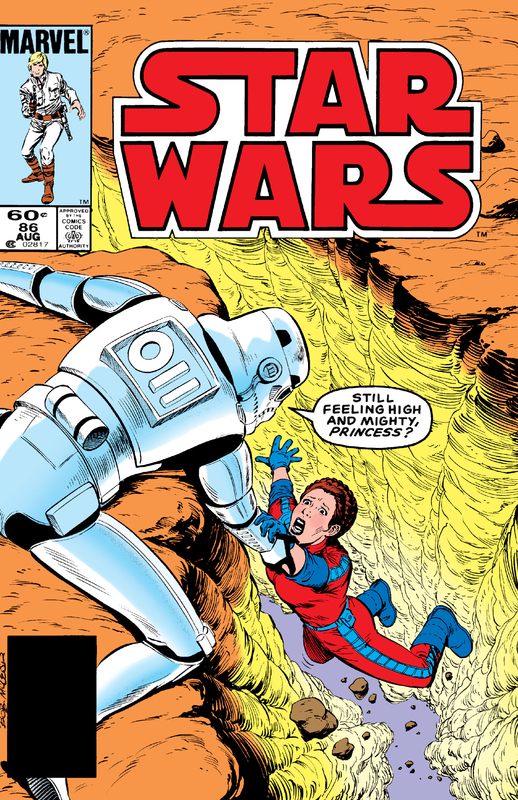 They're an even more entertaining outgrowth of what began with HK-47 and a true pleasure to read. EDIT: I see Hasbro is releasing these two as action figures this Spring. Going to buy them.